It’s crazy to me how many people seem to massively underestimate the power of Twitter. To them, the platform seemingly lets you drone on about whatever you want in just a few short sentences (hands up for the crew that was there during the 140 character times), so what use is that to a business person apart from shameless marketing? Reaching out to people you admire, who may be incredibly successful, is always difficult because it’s likely that their success comes with an equally packed inbox & diary. So how do you get access to these busy people? It’s unsurprising that many of them hang out on Twitter and because of the micro nature of the length of engagements there, it’s far more likely you’ll receive a response or engagement from them. If you’re interesting enough to them, you might even get a follow. The top tip here? Just engage. Don’t be afraid, but also, don’t be creepy. Just be genuinely interested, and interesting and get started. The balance of personal vs business on Twitter is, in my opinion, better than any other platform. LinkedIn is business, Facebook is personal, Twitter falls directly between the two. This makes it a powerful place to build your personal brand, showing people not only what you do, but why you do it, how, what goes on behind the scenes, and what you do the rest of the time too. For this reason, you’ll notice my tweets are a weird mash up of startup thinking, @yenaglobal updates, fun anecdotes and nerding out about space/games/films/other stuff. When networking, it’s easy to feel like you should follow up with a suggestion to meet, although this isn’t a productive use of time, most of the time as in many cases you won’t have discovered enough synergies/crossover to justify the time out of your day yet. So Twitter is great as a digital ‘keep-net’. Use it for all those people you find genuinely interesting, that you’d love to connect with one day, but haven’t a need to yet. Over time, you’ll learn more about them, what they do, what their challenges are and what drives them, so that when you do come to meet the meeting is more natural, flowing and has a higher chance of converting into something interesting. There are a whole bunch of people that I follow for this reason (and because they’re cool) including VCs, scientists, and peers. 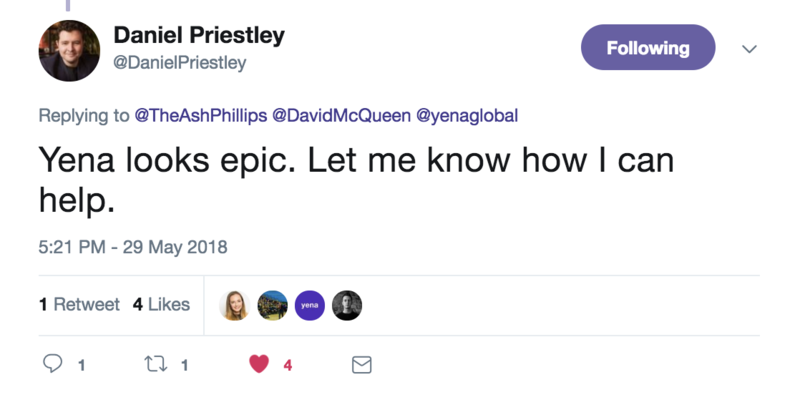 Hands down the biggest opportunity people are missing out on with Twitter is it’s ability to make any cold contact much warmer, to a point where you can get an instant reply from someone with the details of the main point of contact you need within a company to line up a deal/partnership/meeting. Cold calls are dead. No one answers them anymore. No likes making them. Why do it? A tweet is nice, it shows interest in a brand and it’s humbling to have someone engage with you, so you’re inclined to respond. I use this tactic all the time to start partner conversations for Toolbox additions and even sponsorship leads. It works 95% of the time. What would you say the success rate of a cold call is in comparison to that…? Exactly. Give it a go and see for yourself! Be sure to send me any success stories that come of it so I can share in a future newsletter! So, those are my big tips for smashing it on Twitter. No go try it out. And maybe follow me too?